Don't worry if this is the first you've ever heard of SaGa Scarlet Grace. SaGa Scarlet Grace is the final title of an in-the-works Vita RPG that used to go by SaGa 2015. Which is kind of hilarious, as maker Square Enix recently revealed that game's release has been pushed to some unknown date in 2016. Not that I'm complaining. I'll likely buy a copy of SaGa Scarlet Grace whenever it finally sees the light of day--even if that doesn't happen until the very last day of next year. Also, I believe SaGa Scarlet Grace is going to be a polygonal affair--made using Unity, no less--this time around. That's not something I'd complain about, normally, but considering this long-running series is known for its stellar spritework, and also consider how horribly ugly the PS2 remake of Romancing SaGa turned out, I think I should be forgiven for being at least a smidge hesitant when it comes to Scarlet Grace. Anyway, enough about all of that. I said in the header above that we were going to spend some time ogling a couple of just-released illustrations of SaGa Scarlet Grace's main characters, and we're going to do it, damn it. As far as I can tell, the folks at Square Enix haven't revealed who this guy with the oh-so-prominent, uh, sword is, but that doesn't mean we can't give him the once-over while they work up the courage to do so. 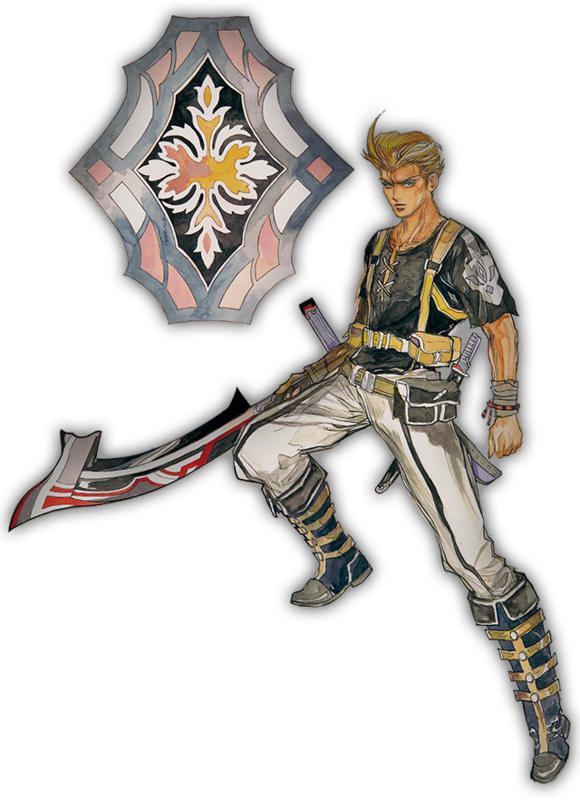 I don't know about you, but I think he looks like a surprisingly appealing mix of Vagrant Story's Ashley Riot and Rocky IV's (or, if you're me, Universal Soldier's) Dolph Lundgren. As dreamy as SaGa Scarlet Grace's mystery man is, he's a pile of horse droppings compared to the damsel shown above. 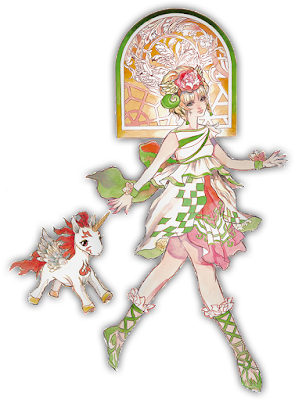 I mean, who could resist being able to step into the ridiculously frilly shoes of a woman who can only be described as a Harajuku Strawberry Shortcake in one of Kawazu's crazy, open-world RPGs? I know I couldn't--especially when the lady in question has what looks to be a My Little Pony-esque "familiar." Granted, we don't know for sure that either of the above characters will be controllable in SaGa Scarlet Grace, but I'd be pretty shocked if they weren't. What do all of you think about these illustrations? Do they thrill you like they do me, or do they provoke some other kind of reaction? Also, how do you feel about SaGa Scarlet Grace? Are you looking forward to buying and playing it, or are you the sort who would rather Super Glue your eyes shut than play one of Kawazu's creations?